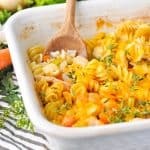 You don't even have to boil the pasta for this nutritious and cozy Dump-and-Bake Chicken Noodle Casserole! All of the ingredients cook together in one dish for a simple comfort food dinner on a cool evening! 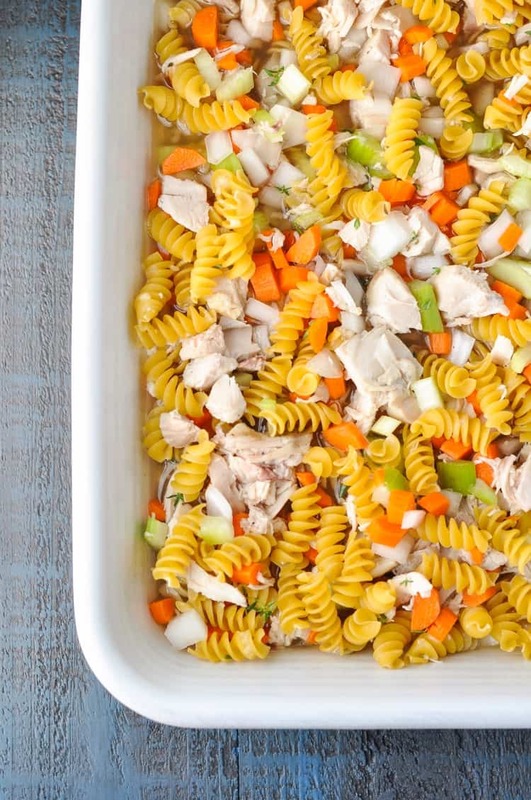 You don’t even have to boil the pasta for this nutritious and cozy Dump-and-Bake Chicken Noodle Casserole! All of the ingredients cook together in one dish for a simple comfort food dinner on a cool evening! 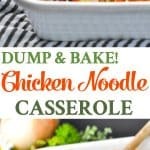 Y’all know how much I love my dump-and-bake dinners, and this Chicken Noodle Casserole is no exception! That’s why this Chicken Noodle Casserole is such a genius creation (if I do say so myself). 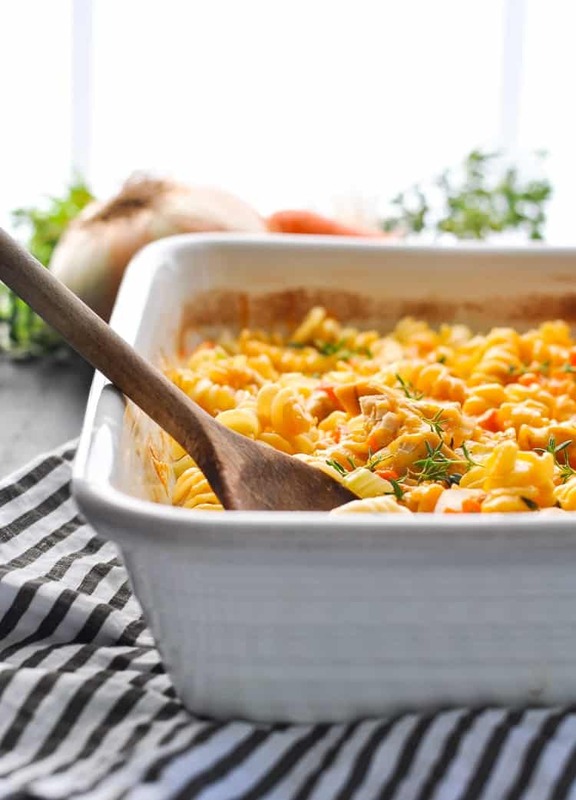 It includes all of our favorite flavors and ingredients from the classic soup, but they’re baked into a hearty and nutritious casserole. Can’t beat a one dish meal on a busy night! But the ABSOLUTE BEST part of this whole meal is the fact that it’s a DUMP-AND-BAKE dinner! In other words, you don’t even have to boil the pasta before preparing the casserole! Just stir all of your ingredients together in the dish, cover it, and bake it in the oven. SO simple, right?! 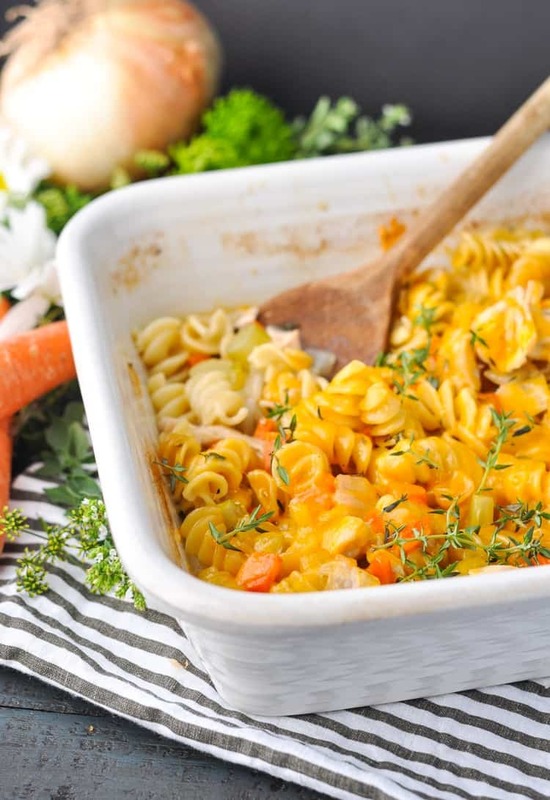 You’ll add some shredded cheddar cheese on top during the final few minutes of baking, which gives the Chicken Noodle Casserole even more flavor and texture. It’s a simple option that takes advantage of leftover chicken from a previous meal, a store-bought rotisserie chicken, or the refrigerated cooked chicken strips that you can purchase at any grocery store. Did you have any idea that a homemade dinner could be quite this easy?! Time to pull out your fall sweaters and get cozy this season with a classic family-friendly dinner that only requires 15 minutes of prep! Cooking for Two? You can cut the recipe ingredients in half and bake the casserole in an 8-inch square pan. The cooking instructions remain the same. Want to Prep Ahead? You can chop all of the chicken and veggies in advance and store them in an airtight container in the refrigerator until you’re ready to stir together the casserole. Preheat oven to 425F (220C). Spray a 9 x 13-inch baking dish with cooking spray. 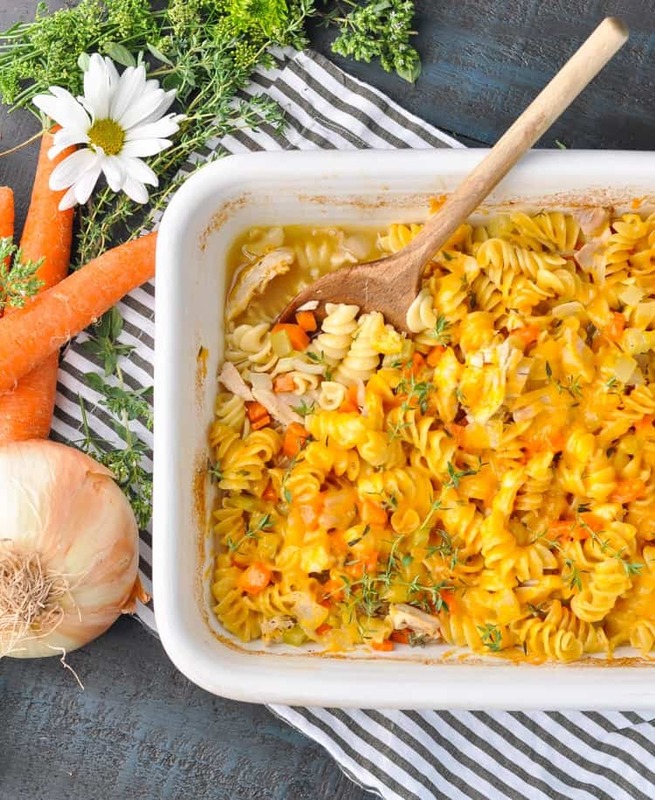 In the prepared dish (or in a separate bowl), stir together cooked chicken, celery, carrots, onion, thyme, garlic, uncooked pasta, chicken broth, and salt. Sprinkle cheese over the top. Bake uncovered for 5-10 more minutes (or until cheese is melted and pasta is tender). Want to Prep Ahead? You can chop all of the chicken and veggies in advance and store them in an airtight container in the refrigerator until you're ready to stir together the casserole. Chicken casseroles like this are my version of pure comfort food. I love that you made your dump and bake version, Blair! I could dive right into this for breakfast! Thanks, Gayle! Chicken casseroles definitely = comfort! Have a great weekend! If I want to use previously cooked pasta, how much do I reduce the liquid? Thanks for the tip Blair, since I too, like to cook my pasta (or rice) separately, in order to eliminate the excess starch.. I’m sure that adding the cornstarch will work. This dish sounds sooo yummy & easy. 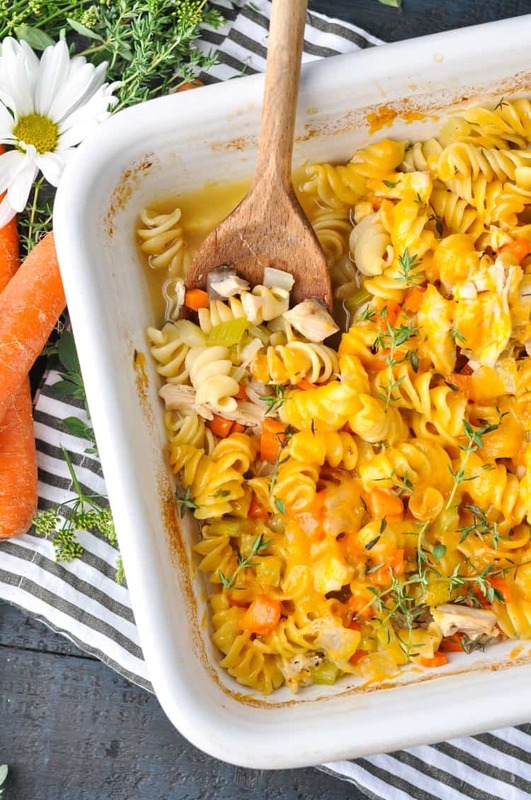 We love Chicken Noodle Soup, so I’m sure this casserole will be a huge hit with my family. The only thing which I’ll do differently, is to use No Yolks Egg Noodles (the ruffled ones), b/c that’s what I normally use when I make chicken soup from scratch. Sounds good, Angelina! Let me know if that works for you! Thanks for such a great idea for someone who cannot have tomatoes with pasta! Thanks again. Blair- My hubby has been feeling cruddy all day, so I made this tonight, along with a batch of your slow cooker applesauce. Perfect meal! He and our daughter gobbled it right up- definitely going in our dinner recipe collection! We are tha Florida evacuees staying in Alabama. It’s nice to see your normalcy at this time. It’s heartening there is something out there that is still normal. Please keep us in your prayers. Love! We have a three year old and a one year old and while they are both lovers of good food, we have to watch the sizes of veggies and meat we give them. Instead of dicing and chopping, I literally threw everything (but the noodles, ha!) in my food processor and pulsed. The veg were small enough for the babies mouth and the chicken shredded into perfect bites. It was so fast and so easy and beyond delicious. I normally prep for dinner in the morning while the baby naps. But wih this meal didn’t have to! Instead, spent the time playing with our three year old. And because it took me all of five minutes to get everything into my baking dish, I was able to spent even more time playing with my kids AND sipping on a martini! You’re my hero. Xo. Love from Vancouver, Canada. Oh, that makes me so happy to hear, Jessica! Thanks for letting me know! The food processor is a great shortcut — love that idea! I have tons of other dump-and-bake recipes on the blog, so hopefully they will offer other quick options for dinner prep at your busy house. Thanks again for your sweet note! Can I just sub. whole wheat rotini? Or would I need to change liquid ratio and cooking time? Hi, Jallyce! Yes, the whole wheat rotini and the elbow macaroni have about the same cooking time, so it should work as an equal substitute. Just keep an eye on it towards the end of baking so that you can pull it out when it’s done and it doesn’t get overcooked (or add a few extra minutes, if necessary). Enjoy! This looks fantastic. I will use canned chicken breast for extra ease on preparation. That should work well, Brandy! That’s great, Brandy! Thank you for letting me know!! I tried the Dump-and-Bake Chicken Noodle Casserole tonight, as written. Perfect–thank you! Love your recipes ideas this will be the first one I try. Can I substitute broccoli for the celery, its what I happen to have on hand? Also has anyone ever tried using the noodles infused with veggies? Does that change the taste? The celery gives the dish that “chicken noodle soup” taste, since garlic, celery, and onion are key ingredients in a classic chicken noodle soup base. You can definitely substitute with broccoli instead, but I just wanted you to know that it will change the taste of the finished dish a bit. I’ve never used the veggies noodles, so I’m not sure if that would alter the taste at all. Just made this and…It’s FANTASTIC!!!! Yay! So glad that you enjoyed it, Kenneth! I tried you recipe twice, once the way you suggest and once on stove top instead of oven. I loved both of them. Thank you. That’s awesome! Thanks so much for letting me know, Gisele! Do you think this can be baked with raw chunks of boneless, skinless chicken? This would save a step, of having to cook the chicken. Would time and/or temperature need to be changed? Hi, Casy! Yes — you can definitely use raw, diced chicken. As long as the chicken is diced pretty small, the cooking time and temperature should remain the same! Do you really need to use cooked chicken? Since it bakes for 45 minutes, could you just cut up a couple of raw chicken breasts and use that?